Old railway sleepers have been transformed into shelves while a vintage Malay dressing table has been converted into a desk. These upcycled items add a rustic appeal to an otherwise modern house. When you walk into Nora Hood’s home, you will feel a sense of peace and calm. Her workspace on the ground floor of the three-storey linked house faces a charming indoor courtyard that has potted plants and rocks. Here, nicely juxtaposed is a metal staircase that leads to the top floor. The skylight three floors above allows in plenty of sunlight. In addition to brightening up the home, the white walls serve as a perfect canvas for Hood to play with décor and furniture. Since moving in at the end of January, it soon became apparent to her that the spot facing the courtyard was the most ideal for a workspace. “You don’t get a lot of houses with greenery anymore, so it is very nice to have some green inside the house,” she says. With the serene surroundings and a fluid layout that allows her two cats to freely romp or lounge around, there is no doubt that this is a dream environment in which to work. Hood, an interior designer, left the banking industry to study design, calling it “the best decision” she had ever made. Her workspace is best described as inspiring, non-disruptive and different. Most of her work is done at home and she goes out occasionally to meet clients and contractors. Summing up her furniture scheme as eclectic, Hood likes pieces that are versatile. “Because we are renting, I want pieces that are able to fit into any setting.” She has picked pieces that add a nostalgic touch to an otherwise modern minimalist space. Her work desk is an old Malay dressing table complete with a mirror. She spent a weekend to distress the piece to retain its vintage appeal. 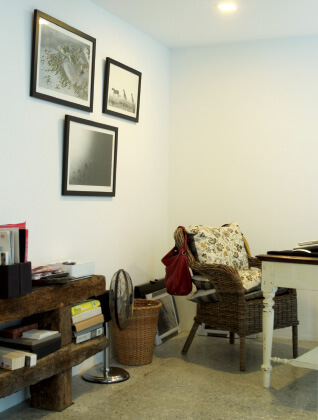 Her bookshelves are made from timber railway sleepers from a nearby kampung. On a wall are three black-and-white photographs that were taken at a fair in South Africa by a photographer who travelled with her pilot husband to capture the landscapes of South Africa and Botswana. “I always look for artwork when I travel and I immediately fell in love with these photographs,” she explains. Decorating a rental may seem like too much effort for something temporary, but Hood shows that it doesn’t take a lot to turn a house into a home — just a little imagination and tokens of the heart.